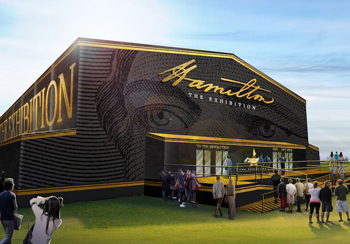 HAMILTON: THE EXHIBITION - a 360-degree, immersive exhibit that will travel to select U.S. cities -- will premiere in Chicago on April 27 for a limited engagement. It will be on display in a specially-constructed free-standing, all-weather structure the size of a football field on Northerly Island in Chicago, where HAMILTON has played a sold-out run since 2016. Alexander Hamilton's remarkable story has inspired millions of Americans. 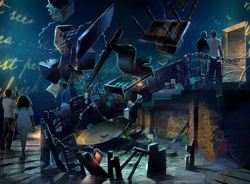 Now you can see it through his eyes in this 360-degree immersive exhibition inspired by the revolutionary Broadway musical. Through a dynamic and interactive mix of lighting, sound, multimedia, music and historical artifacts, you'll experience how it felt to write the way Hamilton wrote, fight the way Hamilton fought, and live the way Hamilton lived. HAMILTON: THE EXHIBITION gives new insight into Hamilton's life and the founding of America, ultimately leaving us to ask the question: How can we leave our own legacies for future Americans? Lin-Manuel Miranda states, "HAMILTON is a musical. It's as much of Alexander Hamilton's life as we could wrestle into two and a half hours of musical theater, and it's been incredible and surreal to see the renewed interest this has sparked in Alexander Hamilton's life and times. I'm so thrilled with the work David Korins has done alongside eminent historians Joanne Freeman and Annette Gordon-Reed, who are experts in this arena. With this exhibition, they're creating an immersive companion piece for HAMILTON, and a deep dive into the details and experiences of Hamilton's story." 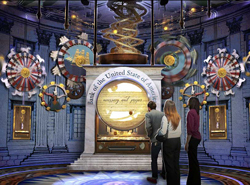 Featuring an audio tour narrated by Mr. Miranda the musical's creator, HAMILTON: THE EXHIBITION is designed to take visitors deeper into the life and times of Alexander Hamilton, while at the same time chronicling the American Revolution and the creation of the United States of America. With a dynamic, interactive mix of in-depth scenography, lighting, sound, multimedia and music, HAMILTON: THE EXHIBITION will give visitors an experiential journey from Hamilton's childhood in St. Croix to his untimely death in Weehawken, New Jersey and the numerous, indelible ways Hamilton's bold actions over 200 years ago affect our lives today. Mr. Seller states, "I hope to use this exhibition to answer some questions that the musical doesn't address, like 'What did Alexander actually do when he was a trader in St. Croix? What did Hamilton's Manhattan look like? How did we win the battle of Yorktown?' In an environment that is visually stunning, aurally thrilling and ingeniously educational, we aim to give visitors yet another unique portal through the life of Alexander Hamilton into the American founding." "HAMILTON: THE EXHIBITION will be an enriching, educational and entertaining attraction for Chicago residents and visitors," Chicago Mayor Rahm Emanuel said. "HAMILTON has been bringing down the house to sold out audiences in Chicago, and I am confident this exhibit will be met with similar enthusiasm. I commend producer Jeffrey Seller, Lin-Manuel Miranda and the creative team behind HAMILTON: THE EXHIBITION for choosing Chicago for its inaugural run." Don't miss the exhibition's launch this spring at Chicago's Northerly Island.